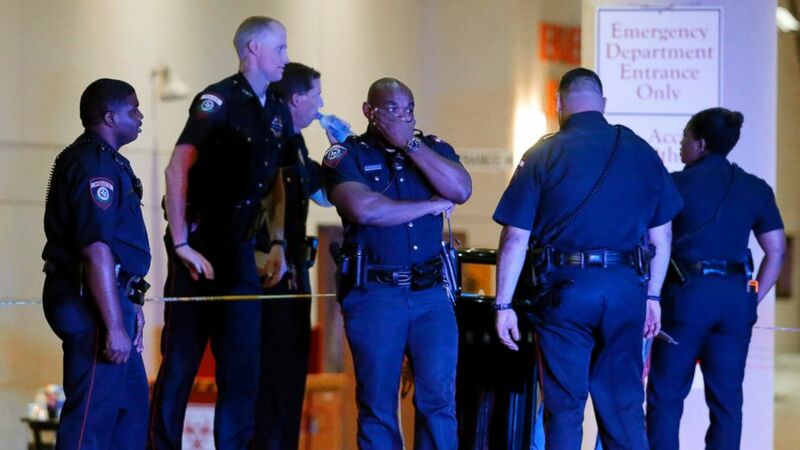 A rush transcript for "This Week" on July 10, 2016.
camera (Tony Gutierrez/AP Photo) A Dallas police officer covers his face as he stands with others outside the emergency room at Baylor University Medical Center, July 8, 2016, in Dallas. THIS IS A RUSH TRANSCRIPT FOR 'THIS WEEK' ON July 10, 2016 and it will be updated. ANNOUNCER: Starting right now on THIS WEEK with George Stephanopoulos -- anger and healing after a week of tragic violence. BARACK OBAMA, PRESIDENT OF THE UNITED STATES: This is not who we want to be as Americans. ANNOUNCER: The country struggles to make sense of the ambush in Dallas and those police shootings in Baton Rouge and Minneapolis. UNIDENTIFIED MALE: I told him not to reach for it. ANNOUNCER: This morning, we have complete coverage, new details on the horrific assassination of five officers, plus, the fresh protests erupting across the country, the raw emotion. CROWD: Hands up, don't shoot. ANNOUNCER: And escalating tension over race and policing. Will our political leaders deepen the split or help us to heal? And the campaign to stop the violence. UNIDENTIFIED MALE: I'm 23 years old. Do I need to start to write a will. ANNOUNCER: We're in the community hearing from all sides on how to you unite the nation. From ABC News, it's This Week reporting now from Dallas co-anchor Martha Raddatz. MARTHA RADDATZ, ABC NEWS HOST; Good morning from Dallas. A city on edge. We're downtown at the memorial outside police headquarters where just yesterday police snipers took to the roof, officers ready with their guns after receiving an anonymous threat to law enforcement. Police and the city itself on high alert after 12 officers were shot, five of them killed Thursday night. We're here on the ground trying to understand the pain, the grief and what comes next speaking with African-American teens worried about their future. And current and former police officers who describe the challenges they face. We'll also tackle the political divide in a polarized America with representatives of both presidential candidates along with our panel. And speak with influential pastor TD Jakes about how we begin to heal the wounds of a nation in mourning. But first let's begin with Matt Gutman bringing us the latest in the investigation. Matt, you've been here since right after the shooting occurred. What's the latest with the shooter? MATT GUTMAN, ABC NEWS CORRESPONDENT: The latest with the shooter is that the investigators have been in his house. They believe that he was capable, and possibly willing to have executed a far more devastating attack here in this city. They found bombmaking materials, a small cache of weapons, a large cache of ammunition in that house. And the FBI is now trying to piece the chronology of the attack. It's made very complicated by the sheer scale of the crime scene. We saw shell casings that were hundreds of yards away from where that shooter was finally killed. And this is a three pronged investigation by the FBI and the ATF. First, they have to investigate the attack itself, then investigate the police involved shooting. There were 12 officers who discharged their weapons. And of course the use of that robot-born bomb to neutralize the shooter at the very end of that shooting spree. RADDATZ: First time that's ever been used as we know. The Dallas Morning News had an extraordinary front page editorial this morning asking for the city to come together. What have you seen? GUTMAN: Seen an amazing outpouring, obviously you see behind you all of these flowers and just behind us yesterday there was a police officer with whom I was talking. And somebody came up to her, an African-American and said my son just wants to hug you and she came up to him and hugged her and they hugged each other and then the start of this long chain of hugs, 30 people ended up embracing her one after the other with such force that her name tag fell off and she was tearing and they were tearing. It was a very meaningful moment and also very spontaneous and genuine, Martha. RADDATZ: It was really a beautiful moment. But we also have seen across the country overnight protests, more protests. GUTMAN: That's right, Martha, in several major cities, including Minneapolis/St. Paul and Baton Rouge. And in Minneapolis/St. Paul a major highway was closed down by those protesters as they clashed with police there. Five police officers injured, the protesters were apparently throwing rocks and bottles, even firecrackers. And in Baton Rouge 99 people arrested as protesters clashed with police there and including those people who were arrested was DeRay Mckesson. He's one of the founders of the Black Lives Matter movement and he managed to film the arrest on periscope, streamed it live. Thank you very much, Matt, for joining us. As you know President Obama on Saturday said that the nation has made progress since the 1960s, but acknowledged it has been a tough week for the nation. For many young black Americans, this is all they know. The question: how do bridge the divide in a polarized America? To tackle that question I sat down with a diverse group of Dallas residents -- law enforcement, community activists, and teenagers to talk about the distrust between police and the communities they patrol and protect. RADDATZ: Tuesday, Baton Rouge. Wednesday, Minneapolis. UNIDENTIFIED FEMALE: We got pulled over for a busted taillight in the back. They killed my boyfriend. A gut-wrenching series of events and here in Dallas a time for soul searching. Marty Woodley's brother was at the peaceful protest on Thursday. MARTY WOODLEY: The number went from one police to two police then from three police. It's such a scary feeling, because it's like, it becomes real once it hits your town. RADDATZ: 23-year-old Devonte Tidwell, the son of a police officer telling me all of this hit too close to home. What was Thursday night like for you? DEVONTE TIDWELL, SON OF POLICE OFFICER: It was scary. I wasn't so much scared for my life. I started to think about things that I didn't think about before, because my dad is a police officer, so I woke up that morning, I woke up on Friday morning, I believe, and I laid in the bed, I was like man, should I start trying to figure out where my dad's life insurance policy is? And I'm 23 years old, do I need to start to write a will? RADDATZ: Dallas police officer Sergeant Willy Ford is caught between two worlds. Grieving for his fallen brothers, fearful for his sons. What do you tell your sons if they're pulled over. WILLY FORD, POLICE OFFICER: I tell them, do what you're told to do. That's number one. And then we'll deal with whatever happens afterwards. I fear for him. I fear for my grandsons. And for me to sit here and say that I don't, I do because this, in this time 2016 things still occur like that. RADDATZ: If there is a reason to hope amid all the fear and pain, it's that this week has forced a difficult and necessary conversation. Detective Ron Pinkston, head of the Dallas Police Association, struggling to reconcile his own experiences of father with that of Sergeant Ford. Do you think African-American males are more at risk when they're pulled over? RON PINKSTON, DALLAS POLICE ASSOCIATION: I go back to what Sergeant Ford was saying, what he tells his kid is the same thing I told my two sons that went to college. When you get pulled over because they were teenagers, you know that's going to happen. How do you act when the officer comes up? What do you do? RADDATZ: Do you think they are at -- as equally at risk as Sergeant Ford's son? PINKSTON: My son, yes. I think they're as equally at risk at Sergeant Ford's. RADDATZ: Is he listening to you, Sergeant Ford? Is he hearing? Is he communicating? FORD: I think it's hard for you to understand unless you've gone through it. And historically even I've gone through that. And I know him, so I'm not saying that he doesn't understand, but I think it's a little bit more personal for me because this happened to me. RADDATZ: But isn't that the whole idea of this, isn't that what we're talking about, bridging that and listening to each other and understanding? FORD: Well, there is a problem understanding if you haven't gone through it and I think for me that's the hardest part trying to convey that to people that haven't gone through it. Those things for us in the African-American community, those are significant events and so they are traumatic events. We're not going to stop doing traffic stops. We're still going to continue to do them, you just have to be, you know, compassionate about how those things impact you but still do your job, but understand people when you're dealing with them. Those are the conversations I think we need to have. RADDTAZ: Detective, you have said that you think it's equally difficult for a white teenage male. If you see it one way, they see it the other way, how do you change perceptions for them? PINKSTON: That's a complicated question. That's one where the communications, where you sit down and you're not going to have one conversation and cure what's affecting our country right now. So many times we'll get a white community here, a black community there and nobody goes to the same church. That's not what's happening in Dallas. We have communication going on here. Are we going to cure all the ills of our country? No. But it only starts if you communicate and having dialogue and that's what I'm saying. RADDATZ: So much to talk about. We turn now to Homeland Security Secretary Jeh Johnson and New York City police commissioner Bill Bratton. Secretary Johnson and Commissioner Bratton spoke side by side on Friday reassuring the nation, calling for unity and standing with Dallas. And they join us now from New York. Good morning to you, both. I want to start with you, Secretary Johnson. We just heard those voices, those strong powerful voices, but also reminds us that there is still a divide. How do you bridge that divide? JEH JOHNSON, SECRETARY OF HOMELAND SECRUITY: First of all, Martha, violence is never the answer. An eye for an eye leaves everybody blind. In these times, building bridges, conversations, community relationships between the community, between law enforcement, can and does work. We want to see police departments across this country that are reflective of the community. We want to see community policing, something that Commissioner Bratton knows a lot about, continued conversation, continued dialogue. This is a time for healing. It's a time for building bridges. We're -- we mourn the loss of five brave police officers in Dallas and there have been incidents all across this country that have created a lot of anxiety. Now is the time for healing, the time for mourning, and the time for building bridges and dialogue. RADDATZ: You know, "The Washington Post" reports that the number of police shot and killed this year is significantly higher than last year. So is this -- is there a growing danger for police? JOHNSON: Our public safety officers have to always be vigilant when it comes to public safety and their own safety. We respect and acknowledge that a police officer has to protect himself. There are ways to do that through police training and -- and the like. We are concerned about incidents targeting the police. The police, it’s important to remember, are there to protect and to serve -- to protect all of us across our communities. They are there as peace officers, as public safety officers. And at a time like this it’s important to stand with them and to remember that they’re there to serve all of us. RADDATZ: Secretary Johnson, what -- what about the federal government’s role in law enforcement? We have thousands and thousands of smaller police forces across the country. Dallas is considered quite progressive. Is there a role for the federal government in overseeing these local police departments to make sure there is uniformity? JOHNSON: Well, our role in the federal government, in addition to our own federal law enforcement efforts -- there are literally tens of thousands of federal law enforcement officers in the Department of Homeland Security. But through our grant-making activity, through the encouragement of active shooter training exercises, through financial support, grant support for surveillance, for communications, through training, through our federal law enforcement training center and the like, there is a role for the federal government to play in supporting local law enforcement efforts. Just in this administration, we’ve enhanced our cooperation with state and local law enforcement to deal with homeland security threats, to deal with challenges to public safety. So there’s absolutely a role and we’ve got to keep at that. RADDATZ: And Commissioner Bratton, I want to turn to you and I want to talk about the killings of two black men this week at the hands of police officers. We saw those videos. What’s your reaction to those videos? BRATTON: Well, those videos are very disturbing to anybody, whether it’s a police officer or a member of the public. And it’s a reminder of the risk to the public in confrontations with the police and certainly risks to the police. And the idea is we need to find common ground in understanding the role of the police and the role of the public. This is a shared responsibility, trying to bridge these differences that are becoming quite evident through many of these videos that are now becoming very frequent on our TV stations and in the public. We have come a long way -- we have come a very long way. And I can speak for New York, but quite clearly events this past week show we have really almost just begun the journey. RADDATZ: And Commissioner Bratton, I want to ask you quickly about the robot that was used to kill the shooter. Is that something we’re going to be seeing more of? Do you approve of that? BRATTON: What we saw in Dallas -- and I approve of the chief’s decision down there to use that robot so as to not put any additional officers’ lives at risk in that circumstance. It will be reviewed, as all shooting incidents are, use of force by police need to be reviewed. And it is something that needs to be done in a very public way. But the reality is that technology is available to us, the threats that are made against us -- and I don’t just mean the police, I mean the public. There were innocent civilians shot during that situation in Dallas. So we will review it. We’ll take a look at it. That capability is there. But it is the first time that type of action has been initiated here in the United States and it deserves to be reviewed. RADDATZ: Thanks very much for joining us, Commissioner Bratton and Secretary Johnson. RADDATZ: And let's bring in senior justice correspondent, Pierre Thomas, who covers law enforcement for us -- Pierre, you've covered law enforcement for decades. And in the last year or so, there has been a real escalation, a surge in homicides, shootings. You were recently in Chicago. What did you see and how can you relate that to what's going on here? PIERRE THOMAS, ABC NEWS SENIOR JUSTICE CORRESPONDENT: Martha, this is a defining moment. These tensions come at a time when political around the country are seeing lots of violence, especially in major cities, much of it with guns. And we know in many of those cities, a lot of the victims and the suspects in the shootings are African-Americans. Sadly, blacks are overrepresented in urban violence. But we should be clear that the violence is not just contained to cities and it crosses racial lines. More than half of the people murdered in 2014 were white and roughly half of the murder suspects were white. To further intensify the situation currently, the number of officers killed by gunfire is up 44 percent compared to last year. But regardless of the pressure, the citizens of this country of all races deserve the best of policing. What we're seeing now is that when police make mistakes, they're much more likely to be caught on tape and we're -- the view we're getting sometimes is ugly. We're seeing that some of the biases that African-Americans have been complaining about for years are, in fact, real -- Martha. RADDATZ: So what's the solution here? THOMAS: Training, training, and can I say training again? Offers who are properly trained in how to respond to all kinds of situations typically perform well. And that's what usually happens more often than not. We should say, Martha, that there are thousands of thousands of interactions between police and the public every day that go just fine. I spent a lot of time with police. And what I've found is that the best officers seek to de-escalate situations. That's the common trait -- they're trying to lower the heat when they can. And the other thing that's helpful is diversity. Communities of all hues like to see officers that look like they do and understand their culture and all the nuances that come with it. But I should say, a properly or poorly trained officer is the key. Someone who's bad is bad whether they're black, white or green. And it's key that the police departments know the communities they serve and have direct lines of communication. And they must have a mechanism for dealing w the minority of bad officers that are out there. The only thing that strikes me over and over again is how a patrolman comes in contact with so many people, if they're bad, they'll have a disproportionate effect on the community. RADDATZ: Always great to have your perspective, Pierre. And coming up in just two minutes, will the next commander-in-chief help bring the country together or deepen the divide? I'll talk to supporters from both sides, including a possible Trump VP pick. And later, beginning to heal -- our interview with influential pastor TD Jakes, as residents of Dallas work to answer this emotional appeal from their police chief. DAVID BROWN, POLICE CHIEF, DALLAS: Our officers are going to need to hear from you more than just today, that you appreciate their sacrifice. DONALD TRUMP (R), PRESUMPTIVE PRESIDENTIAL NOMINEE: Now is the time for prayers, love, unity and leadership. Our children deserve a better future than what we're making them live through today. HILLARY CLINTON (D), PRESUMPTIVE PRESIDENTIAL NOMINEE: I would not be here tonight if I did not believe we can come together with a sense of shared purpose and belief in our shared humanity. RADDATZ: Hillary Clinton and Donald Trump, each reacting to the shootings this week. Both candidates calling for unity, each with very different ideas on how to get there. We'll be joined by Congressman Joaquin Castro, a Hillary Clinton supporter, in just a moment. But let's start with retired Lt. Gen. Michael Flynn, former director of the Defense Intelligence Agency, a Trump campaign adviser and author of the new book, "The Field of Fight." We've also learned he's being vetted as a possible Trump running mate. LT. GEN. MICHAEL FLYNN, FORMER DIRECTOR, DIA: It's good to see you, Martha. Thanks for having me. RADDATZ: I want to start with one of truly the most important questions facing the country right now and that is who could keep us safe? Which leader could keep us safe? Why is Donald Trump better equipped to handle the challenges of racial division, guns, police violence? FLYNN: Yes, one word: leadership. And I will tell you that one of the -- two quick points that I'd like to make about what we have experienced and what we're experiencing in this country, you know, there's a -- there's sort of one race. There's the human race. And then there's another major point that we have respect and that's the strategic advantage of the rule of law in this country. And the rule of law in this country is something that makes us vastly different than all other countries in the world. And without respect for that rule of law, which is the face of the rule of law in this country is our -- the men and women that serve in our police forces. So we have to have that. So back to your question, it's about leadership and it's about responsible leadership as well. And I believe that we can't keep going in the direction that we're going, Martha. I mean, the country's going in the wrong direction. RADDATZ: -- in Orlando showed that voters think Hillary Clinton showed a better temperament to respond to things like this. You talk about Donald Trump's leadership. FLYNN: I think her speech a couple of nights ago was totally irresponsible when she talked about white people being to blame. I mean, that is so irresponsible. What we have to look at is speech that's positive, that's forward-looking and demonstrates an intellectual courage that doesn't try to attack an ideology one way or the other. I mean, how are we going to fix this? RADDATZ: You bring up Hillary Clinton; Donald Trump said the Black Lives Matter movement was trouble, a disgrace, with hate. Do you think he's sensitive enough to the challenges of African American voters? FLYNN: I'm not going to speak for Donald Trump but what I will tell you is that I do believe that we have to look at what is going on in this country, be responsible in what we say and, like I said, I think that there's one race that we have to worry about and that's the human race. This country, to survive in a -- going on in the future, and I'm not just not talking about the next four years but for the -- for the next 50 or for the next 100, we have to demonstrate a much greater role in leadership and also how we see the direction of our country. RADDATZ: Let me stay with the matters of police. What is your reaction to the videos we've seen, to the police killings, of the man in Minneapolis and Baton Rouge? FLYNN: Yes, I think that you have to wait to see -- I don't know what all the -- you know, I don't know what all is behind that. I think that we have to -- like our system is so designed upon, you know, look at what the investigations come out with and see what happens. When you see short clips here, short clips there, that doesn’t give anybody a good enough impression of what actually happened. And people, you know, just inflame themselves. So we have to be cool heads have to prevail and like I said, I believe we need to demonstrate a much greater intellectual courage, especially at the senior leader level from this president on down to anybody who wants to -- who believes that they can run this country. RADDATZ: Let's talk about the next leader. You are being vetted, we are told, as a vice presidential candidate. Is that true? RADDATZ: Do you want to be vice president? Would you like to be --? RADDATZ: So it's a job you'd take? FLYNN: -- from a -- for a -- (INAUDIBLE) little town in the smallest state in the union, Rhode Island, it's a pretty big deal. And I take it very seriously. If people are serious about it, you know, I have to be serious about it. RADDATZ: You've been a registered Democrat, correct? FLYNN: I grew up as a -- in a -- in a -- I grew up as a Democrat in a very strong Democratic family. But I will tell you that the Democratic Party that exists in this country is not the Democratic Party that I grew up around in my -- in my upbringing, not at all. FLYNN: I vote for leaders. That's what I vote for. When I vote -- and I -- and I honestly -- I didn't vote much at -- in the military because I served whoever was the commander in chief in the military. But I vote for leadership. That's what I vote for and I vote for America. RADDATZ: I want to go to your -- you know a lot about foreign policy; you served in the military. But since you haven't taken yourself out of vice presidential contention, let me quickly ask you a couple of questions about where you stand on other issues. FLYNN: -- they are the ones that have to make the decision because they're the one that's -- ones that are going to decide to bring up that child or not. RADDATZ: But if you -- if you become a vice president, you have to be prepared to be president. RADDATZ: Let's talk about immigration. Let me ask you immigration: should all undocumented immigrants be deported? FLYNN: So undocumented or illegal? FLYNN: Are they here illegally? I mean, if they're here illegally, then it's illegal. I mean, again, back to my very first point, the rule of law in this country is probably the single biggest strategic advantage that we have, above and beyond all other countries in the world. And we cannot allow the rule of law to break down. RADDATZ: And very quickly, your reaction to Hillary Clinton not being charged with (INAUDIBLE) classified documents. FLYNN: Unbelievable. I mean, she -- the FBI director said that she lied, essentially, and what he -- what he should not have done was he should not have offered his opinion outside of telling the attorney general. He should not have offered that opinion, I don’t agree that he did that. RADDATZ: OK. Thank you very much for joining us and good luck with the upcoming months. RADDATZ: And we talked to General Flynn just a short time ago, so now let's bring in Texas congressman Joaquin Castro, a Hillary Clinton supporter. REP. JOAQUIN CASTRO (D), TEXAS: Great to be with you, Martha. RADDATZ: I want to start with the same question that I asked Lt. Gen. Flynn. Why is Hillary Clinton better equipped to handle the challenge of racial division, gun violence and policing? CASTRO: Most of all because she’s been somebody who’s tried to heal the division of our country. If you listened to her in Philadelphia, she acknowledged longstanding tensions between the African-American community and police, but also said that all Americans should respect the very difficult job that our police do. And she’s somebody whose very message in her campaign about America being stronger together is something that we all need right now. RADDATZ: You know, it seems like the country truly is at a boiling point. You’ve seen your state here and what’s gone -- what’s happened in the past few days. There’s so much anger and so much division. Secretary Clinton, like Donald Trump, is a divisive politician. In our latest polling, 55 percent of Americans have an unfavorable view of her. How can someone with those unfavorability ratings bring this country together? CASTRO: Well, the fact is she’s trying. In every single thing that she’s done during her public service career, she’s tried. She’s not making comments about people’s ethnicity or calling people racists or murderers. She’s not threatening to ban people based on religion. She’s somebody who’s seeking very hard to earn the trust of the American people and to bring all of us together. RADDATZ: She made the point Friday -- and General Flynn pointed out -- pointed this out, that white Americans need to better understand black Americans. That can be very off-putting to some white voters. RADDATZ: And she isn’t doing so well with large segments of white voters. RADDATZ: Is she sensitive enough to their needs, to Trump voters? How do you bring those people together? How do you reach out to white voters like that? CASTRO: No, absolutely, and what Hillary is saying is that each of us lives a different experience in the United States. And I was heartened to see somebody like Newt Gingrich acknowledge that if you’re black in this country, or a person of color, you may have a different experience with police. Conservative writers and RedState -- I read a great article on RedState -- and also the conservative writer Matt Lewis who wrote about the fact that what we’ve seen on video with, you know, Tamir Rice in Cleveland and New York and Baltimore has been eye-opening for many Americans. And it’s something that is very thorny that makes us uncomfortable but something that we have to deal with and come to terms with. RADDATZ: But -- and this week, earlier this week, it was announced that there would be no charges filed against Secretary Clinton for mishandling classified documents. And yet you heard what the FBI director said about her. She was extremely careless, put national security at risk. Her e-mails possibly read by foreign governments who are not our friends. How can Americans trust someone who was, as he said, extremely careless with classified materials as a leader? CASTRO: I think that first of all there’s no perfect politician. Hillary Clinton’s been in public service for many years and done amazing work, but she’s also admitted when she’s made mistake. And this was one of them. I think that what we hope for from our leaders is that, when they do make mistakes, they acknowledge those mistakes and they learn from them. She’s shown in the past she can do that and that’s how she’s going to behave as president -- responsibly, she’s going to learn from her mistakes, and she’s going to focus on the issues that matter to Americans like gun violence, racial tension right now, opportunity for all Americans, and keeping Americans safe. RADDATZ: It also seems like Secretary Clinton is just saying move on, I don’t want to talk about the emails anymore. I made a mistake and we shouldn’t talk about them. But having an FBI director say you’re extremely careless is pretty serious stuff. CASTRO: Well, sure, and she admitted that was a mistake to use e-mail that way. It’s the mistake that was made by other secretaries of state. It’s a mistake that’s been in the government, not only in the State Department but in other departments as well. But if anything, Martha, the tragic week that just passed, this very painful week in American history, should be turning point of the congress and for our government where we start to move on and focus on the issues that matter to Americans. RADDATZ: Let’s talk about legislation. What new laws are congressional Democrats or Secretary Clinton proposing that could’ve stopped a rampage like this one? Or the shootings of African-Americans by police? CASTRO: There have been many things that we’ve tried. For example, I got $8 million into the appropriations bill, extra dollars in the appropriations bill, for body cameras. There isn’t a silver bullet solution. We’re going to have to work on community trust with police, de-escalation of conflict and tense situations between police and African-Americans and other people of color. We’re going to have to put body cameras on our law enforcement officers. And then also the criminal justice system needs to be reformed. But none of that can happen as long our focus is just on partisan fights and politics. This is a congress, you know, that over the last few terms has been incredibly unproductive. It’s been a congress, unfortunately, that has been on the sidelines of American governance. And if we’re going to solve the kind of issues that we need to solve, that can’t be the case. RADDATZ: OK, thanks very much for joining us this morning. And we’re so sorry for what happened here in Dallas. I talk to the influential pastor who is providing support to the local Dallas community. How do we tart the healing process and how long is the road ahead? And when we come back, politics and polarization. We examine the outrage and anger across America with our roundtable next. REP. MARC VEASEY, (D) TEXAS: I feel like that I need to be very frank with them. I feel like I need for him to know that this is how the world is and I want you to survive. I want you to outlive me and I want you to go on to do great things. RADDATZ: Congressman Marc Veasey on the struggle so many African-American parents are facing: how to talk to their children about interacting with the police. Our roundtable shares their personal reflections when we come back. ANNOUNCER: THIS WEEK with George Stephanopoulos is brought to you by AT&T. RADDATZ: Civil rights icon John Lewis and President Obama, two African-American leaders from two different generations, each with very different opinions about where this country is at this moment. Here to take that on, "Nightline" co-anchor, Byron Pitts, presidential historian Doris Kearns Goodwin, ABC News senior legal correspondent, Sunny Hostin and ABC News political analyst, Matthew Dowd. Thanks to all of you for coming on this sad period in our history. And -- and Byron, I -- I want to start with you. People are angry and people are frustrated. We've seen both of these horrific events this week. You've been around the country. You've been around Dallas this weekend talking to protesters, talking to police. What -- what is going on? BYRON PITTS, ABC NEWS CORRESPONDENT: All those emotions are true. I think it's also about perspective, where you stand. If you live in West Baltimore or if you live in Ferguson, people are angry. They're scared. They're frightened. If you're in law enforcement, some of those same emotions. But -- but, also, great sadness right now. There was a powerful moment here a couple of nights ago, a police officer, a Dallas police officer was walking around and these two little Hispanic girls walked over to -- to -- to hug her and -- and talk to her. A wonderful moment. And then suddenly, the police officers start weaving. This whole space went dead quiet. And so people are many things, but -- but deeply sad and scared. RADDATZ: But -- and -- and Doris, give us some historical context here. You just heard John Lewis. You just heard President Obama. Are we slipping backward or -- or not? DORIS KEARNS GOODWIN, PRESIDENTIAL HISTORIAN: I think I agree with John Lewis that it's not 1968. But what's so heartbreaking as an historian is when you look at that Kerner Commission report that said we are moving into two societies, one black, one white, one separate but unequal, the whole potent mix that produced those riots in '67 and '68 is still there. And that's what's so sad as an historian. You think you want to learn from the struggles and the triumphs of the people who went before. But they talked about racism and they talked about joblessness, they talked about hopelessness in those inner city communities. And I think what scares me most is that in a democracy, it's so central that people from different sections and castes and races can see and feel each other and have fellow feeling and empathy. And that's what we're missing right now. And -- and Teddy Roosevelt said you can't have a democracy if people don't understand each other's points of view. So somehow that feeling, it's not just knowing, it's feeling what it's like to be a black vulnerable to a police and feeling what it's like to be a white policeman vulnerable to feeling that something is going to happen in their situation. RADDATZ: And, Sonny, one of the things about this week is in such rapid succession we had two African-American men killed at the hands of police officers and then this horrific shooting here. Does that -- do you think that brings people together? It obviously puts a focus on these issues. SUNNY HOSTIN, LEGAL ANALYST: Well, I hope so. I hope that we can have collective outrage now. Because what I've been seeing is selective outrage you have when you have two African-American men shot within one day of each other by police, the African-American community was outraged. But I didn't see that outrage in the white community or in the police community, quite frankly. Now, you see a lot of outrage because five officers were tragically gunned down. But also selective outrage. So perhaps we can have this conversation collectively and grasp at that collective outrage and move forward and do something about it. We've been divided on this issue for far too long. It's time for us to come together and try to figure out some way to move forward cohesively. RADDATZ: And, Matt, you, too, have traveled across the country. You've talked to voters. You've talked to people. You live in Texas. You're also covering the presidential campaign. And when you look at two leading candidates in both parties who have such -- have such very high unfavorability ratings, what does that mean? How do -- how does one of them bring the country together? MATTHEW DOWD, ABC NEWS CORRESPONDENT: Well, I -- I think it's very difficult at this moment, but it is possible. I don't know if they have the capacity in themselves to do it. I disagree with a bit -- with the -- with what the president said, which is I do think we have incredible divisions in this country, incredible divisions. And what we've seen over the last few days is an example or a symbol of how many divisions there are, how one part of America has a difficult time looking across the other part of America and seeing it. And I think what unfolded here is an example of some of the worst things in Texas, some of the worst things that we think, but also some of the best things about the state. You know, we're -- to the left of us, in front of the Dallas police quarter -- headquarters is the Lone Star flag, which really is -- it's supposed to be a symbol of unity, one star above all over everybody in the course of this. I think the American public actually is further ahead. Byron and I were talking about this -- are further ahead than our leaders are in this time. I think our leaders haven't been doing -- doing enough to appeal to the unity of the country. Much of it, what they've said, the rhetoric they've used and the actions they've taken has actually divided the country more than it's united us. RADDATZ: Well, sonny, let's talk about something that Donald Trump this week, he -- he said he was comp -- some people were surprised and -- and kind of complimentary about Donald Trump's statement on Friday after Dallas. He mentioned the killings of Alton Sterling and Philando Castile, calling the killings senseless. Do you think he had the right tone? HOSTIN: I think his tone was right, but I think it came a bit too late. I think Donald Trump was silent when we heard about Alton Stirling. He was silent when we heard about Philando Castile. We only heard from Donald Trump after the murder of five police officers. And so again, we're talking about selective outrage and not collective outrage. And to be clear, what happened here in Dallas with these police officers is tragic. But the fact of the matter is that anti-police violence is at an all-time low, whereas the shootings of African-American men by police is up 6 percent. And so there are real legitimate issues within the African-American community that have not been addressed by politicians, and certainly haven't been addressed by Donald Trump. DOWD: Martha, I'm in no way a supporter of Donald Trump and I think he's been, in many ways, been incredibly divisive in this country. He did make the right statement in the aftermath of the five police officers. Should he have said something earlier on the other incidents that happened? Absolutely. But I think part of what we have to do is let people evolve and try to grow and not every time they do something, say oh, wait a second, they should have done X, Y and Z.
I think he should have but I think, actually, he did the right thing in the aftermath. And so I think let's push him further along that path, as opposed to dividing us again. GOODWIN: The trouble for us is that we do have an all-time low of trust in politicians. I mean I saw some surveys that they were way down at the bottom. Below them were lobbyists and above them were telemarketers. And in a democracy, that's a real problem. Politicians used to be an honorable vocation. If we untrust our politicians or distrust them so much, are our best people are not going to go into public life? I mean we're looking now at two politicians running for the president who have the least trustworthy statistics in history. And what does that say about a country that we have to look to them to lead us? RADDATZ: -- is there going to be more unity? What do you -- what do you expect when you see the convention in Cleveland, the convention in Philadelphia? PITTS: Well, certainly, as journalists, we are preparing for trouble. That -- that seems to be the direction we're heading in. It's difficult. I mean we're talking about some leadership. It seems like we are in a difficult moment, so we need greatness. So a better than usual comment from Donald Trump perhaps doesn't do much. The issues with Hillary Clinton, not being trusted. People are angry and frustrated. This raises a point about, again, it's all about perspective. RADDATZ: What about Hillary Clinton's comment -- General Flynn brought this up. It was critical for saying white people don't understand. PITTS: People I talk to, still both small, these are big issues and people are making small statements. This point earlier about this doesn't -- I think America is seeing the tensions but these tensions have existed in urban America for a long time. People aren't just getting angry, they've been angry for a long time. Now, because of what happened in Dallas, other people are now beginning to recognize that anger. GOODWIN: And I think because of the video cameras, we feel what's happening. Words never had told us before how much of this was going on for such a long period of time. And the interesting thing is in World War II, when we finally saw, in 1943, , two years after Pearl Harbor, the first dead soldiers were on a beach. Then people suddenly understood the sacrifices that people were making. It used to be censored, that you shouldn't see dead people. Finally Franklin Roosevelt realized the home front wasn't realizing the sacrifices enough. So he allowed that picture, that iconic picture to be shown. And now we saw these people dying on Facebook. It makes you feel this tension now, which has always been there but maybe there's a visceral level. RADDATZ: And politicians are using that as well and in ways never before. DOWD: Politicians most of the time follow where the country is going and I think, in this case, maybe somebody will emerge that will follow where the country wants us to lead. I think a huge part of the problem that our leaders have is they can't even agree on a common set of facts. DOWD: They can't even agree to say it's OK to take different positions but agree to a common set of facts. So when we have things like this happen, what's really the problem? What going on in the criminal justice system? What's to do with guns? You have to agree to a common set of facts and we don’t have that today. And my worry, when you don't have that, democracy is broken. RADDATZ: And Byron, I just want very quickly, if you will, personal reflections. You have a 23-year-old daughter. PITTS: We're talking about the talk. Black folk have been having the talk since 1619, the day we African slaves arrived from this country. I tell her how she should carry herself. I tell her to be responsible. And I also tell her what Congressman John Lewis has said, again, about perspective. We aren't where we should be but America is in a much better place than where it was when I was 23 years old. HOSTIN: But can I add to that? HOSTIN: I'd like people to think about it this way: I'm a risk-averse parent. The top cause, the leading cause of death for children under 5 is drowning. I taught my kids how to swim. My kid, my black son can die by the hands of the police at a 2.5 times greater rate. I have to teach him how to swim in that environment. That's not the same discussion that white parents have with their children. RADDATZ: OK. Thank you all so much for your insight and thank you so much for joining us here in Dallas. We are here in Dallas, outside the police headquarters. People paying their respects at that beautiful memorial to those fallen officers behind us, as the city searches for healing. More on that with Pastor T.D. Jakes and a tribute to those we lost after this. CHIEF DAVID BROWN, DALLAS POLICE DEPARTMENT: We're hurting. We are heartbroken. There are no words to describe the atrocity that occurred to our city. RADDATZ: "Our hearts are broken." The raw emotion from Dallas police chief, David Brown, capturing the mood of the country as we mourn those we lost this week. In Baton Rouge, 37-year-old Alton Sterling leaves behind five children. In Minneapolis, Philando Castile, dying in front of his girlfriend, Diamond Reynolds, and her 4-year-old daughter. Here in Dallas, 43-year-old officer, Brent Thompson, a newlywed, leaving behind his wife of only two weeks. Officer Michael Krol, who dreamed of being a police officer, spent almost a decade with the Dallas Police Department. Officer Patrick Zamarripa, a father and a veteran of three tours in Iraq. Fifty-five-year-old Sergeant Michael Smith, a 26-year veteran of the force. And Senior Corporal Lorne Ahrens, described by colleagues as a big guy with an even bigger heart. Yesterday I spoke with Dallas pastor T.D. Jakes about the long road ahead for a nation in mourning. RADDATZ (voice-over): No doubt the past week brought more pain than solace. UNIDENTIFIED FEMALE: He is 15 years old. He had to watch this. RADDATZ (voice-over): At types the bad news -- and worse somehow, the bad blood, bad faith felt relentless. But as the nation catches its breath, we notice moments of shared humanity: officers running towards the bullets, protesters shielding a child with their bodies. And to help heal, an injured city has turned to a pastor known for building bridges, Bishop T.D. Jakes. BISHOP T.D. JAKES, PASTOR, DALLAS: Today is a very solemn occasion and yet it is a hopeful occasion. RADDATZ (voice-over): We visited Jakes at his 17,000-strong Potter's House Church in Dallas. He's "Time" magazine's "America's Best Preacher" but he is also the father of three young black men. JAKES: I don't know any African Americans who don't live with that reality every day, that don't tell their children to be extra careful if the police stop them. That resonates with me -- and not just as a pastor but as a father. My people are from Mississippi and from Alabama. My grandfather was killed by white racists, murdered and thrown in a lake. So this is not shocking and foreign to us. It is the way that we live. RADDATZ (voice-over): But spurred to action by fatherhood and Ferguson, here he is at Michael Brown's funeral. Jakes is no fatalist, either. RADDATZ: You saw this as a moment of hope. JAKES: We don't have a third bathroom or a colored water fountain, which I remember vividly. We have already seen real change. But the completion of that change won't be complete because change doesn't happen through legislation, change happens in the hearts of people. RADDATZ (voice-over): And he says the horrors of this week could finally be a catalyst to open hearts on all sides. JAKES: We're actually talking to each other. And I think that's a sign of a first step toward understanding each other. It's not always important that we agree. But if we can at least understand each other, perhaps we can begin the healing process that Dallas needs and our country needs right now. RADDATZ (voice-over): The pain is real but there's also sympathy. JAKES: It's very difficult to be a warm-hearted human being and not recognize the pain of a grieving mother, a child who's overcome with grief, whether his daddy was a police officer or whether his daddy was selling cigars on the corner. Pain is pain and America is hurting right now. RADDATZ: It's a powerful sentiment, offering some brightness even as we grieve. RADDATZ: That's all for us today. Thanks for sharing part of your Sunday with us. We'll see you next week from Cleveland, on the eve of the Republican convention. And follow us on Facebook and Twitter this week, as we drive from Dallas to Cleveland, taking a pulse of a nation on edge. We leave you this morning with images of the two police cruisers memorialized in front of police headquarters, now almost completely covered in flowers, cards and messages of grief and hope.